The principle of evaporative cooling, applied among others in cooling towers and evaporative condensers, plays a fundamental role in modern industry, where it is one of the most effective alternatives in the field of refrigeration. Evaporative cooling is used in almost all industrial applications that require refrigeration: food industry, automotive, iron and steel or electronics; At the same time, it forms the basis for a multitude of industrial, commercial and hospital refrigeration installations, as well as for air conditioning and refrigeration systems for machinery. In Europe, more than 500,000 industrial installations use evaporative cooling equipment, one of the most effective alternatives in the field of industrial refrigeration. Large areas are important energy consumers so any measure of energy savings that can be adopted in them offers great possibilities. In this context, refrigeration is one of the most outstanding chapters, as air conditioning is the element with the greatest impact on the energy expenditure of these centers, with special incidence during the summer months. However, there are very few shopping centers in Spain that have sufficient data on their energy consumption or have put in place an energy efficiency plan. Different existing studies put the potential savings of annual energy consumption of these surfaces between 20 and 35% and estimate that an efficient energy management could come to represent an annual saving of 48,000 euros. En este contexto, los sistemas de enfriamiento evaporativo constituyen una alternativa a tener presente, en la medida que estos espacios requieren una climatización segura, fiable y eficiente energéticamente. Pero, ¿cuáles son las ventajas que aportan estos equipos frente a otras tecnologías? Its capacity for energy saving far exceeds that offered by alternative solutions, such as self-refrigerators that have been widely used in large areas, but which, however, are less efficient and increase energy consumption. The advantages of this technology have to do with the high efficiency ratios it presents. According to a comparative study conducted by the ICAEN (Catalan Institute of Energy) a few years ago, the evolution of energy performance curves indicate that, in any power, the most energy efficient systems are wet, followed by hybrids and, to a large extent, distance, from the dry ones. They are respectful with the environment and safe for human health: in these aspects have decisively influenced the technical advances recorded in recent years. At present, the equipment incorporates safety tools such as droplet separators that prevent the diffusion of water droplets large enough to carry the bacteria at a long distance; the mandatory use of biological maintenance programs is mandatory; and it establishes the adoption of other precautions (provided for in the legislation) such as the removal of equipment from people’s passage areas, which favor that the possibility of proliferation and, where appropriate, spreading to the environment of the bacteria is practically null All of them are aspects to take into account when assuming the design and construction of a shopping center. 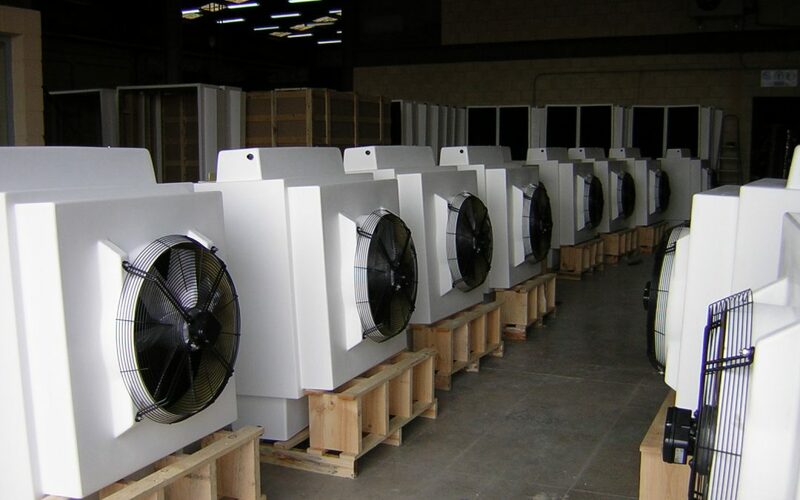 In the business and industrial fabric, the use of evaporative cooling equipment is a priority in order to reduce the expense associated with both the widespread use of air conditioning and the high demand for cold in industrial processes, the main responsible for the high demand existing energy. In this context, the demand of large and small companies represents a specific weight: around 30% of the total compared to 13% that represents approximately the services sector. In the industrial field, metallurgy, the chemical industry, the production of non-metallic mineral products, the manufacture of motor vehicles or the food industry are some of those that generate the greatest consumption. In all the mentioned sectors, the cold intervenes in the manufacturing processes, and the production of this cold requires, in turn, electrical energy. In fact, maintaining the correct temperature of the fluids or rooms within these industries is so important that it can have a huge impact on the profitability of the plants. The processes of handling and manufacturing of finished products are very long and, at almost every step, some type of cooling and / or heating is needed. What can evaporative cooling bring in industrial applications? Evaporative cooling, used in refrigeration and air-conditioning installations with water condensation, is a natural process that uses water as a refrigerant and is applied to the transmission of excess heat from thermal processes and machines to the atmosphere. As a result, the greenhouse effect is reduced by limiting indirect CO2 emissions thanks to the savings in electrical energy consumed, and direct, by the lower risk of refrigerant gas leaks. These equipments offer an ideal combination of energy use and installation cost, resulting in an optimal investment / performance ratio compared to similar solutions. Its electric power consumption is lower. In air cooling systems, as the condensation temperature increases, the refrigeration production of the installation decreases, that is, to produce the same refrigeration effect, a compressor, an electric drive motor and a condenser of higher sizes and costs are required. The reduction of energy consumption is achieved for two reasons: the efficiency of the process and the high energy efficiency it offers. The efficiency is given because, the greater the efficiency of the industrial process, the lower the amount of energy that is lost and the easier it is to get rid of residual heat. The high performance results from the fact that evaporative cooling allows to achieve water cooling temperatures of up to + 25 ° C or lower, as well as the use of intermediate heat exchangers, which means that the processed fluid can be cooled in a closed circuit up to 30 ° C or less. In air conditioning and refrigeration installations, energy efficiency and electric power consumption are directly related to the condensing temperature of the refrigerant used in the refrigeration system. In a typical air conditioning installation, the comparison of energy consumption shows illustrative figures: water condensation equipment, including cooling towers and evaporative condensers, would offer, compared to air condensation, savings in consumption of up to 45%. %. Another example in the same line would be the one produced in the refrigeration facilities, where the powers absorbed, when the condensation of the refrigerant is made by water cooled by evaporative towers and condensers versus when it is made by air, are significantly lower. The evaporative refrigeration in the industrial sector finds special application in the alimentary industry, in which it employs in his two thirds parts, being indispensable his utilization in those industrial processes that use the ammonia like refrigerante, as it is the case of this sector (industry meat, dairy, beer, etc. ), offering in all of them advantages at the energy level and, consequently, economic. The conservation of food is longer as soon as possible to reduce its temperature to optimal levels of storage. The conservation of all meat and fish, fruits and vegetables, dairy products, etc. it is ensured by means of low temperatures. On the other hand, the industrial air conditioning is another application of refrigeration that, unlike air conditioning in office or residential buildings, is carried out to achieve adequate conditions in the rooms where these products are processed, handled and packaged. Industrial air conditioning differs mainly in the state of the supplied air, defined by the level of temperature, precisely controlled humidity, stricter filtering and previous removal of contaminants. In a society like the one in which energy saving and the search for formulas that contribute to improving energy efficiency have become a constant in recent years, evaporative cooling offers in all those applications where cooling is required some energy efficiency ratios much higher than those provided by other systems.